We are looking for professional dancers for our high quality shows and theater productions aboard the Mein Schiff fleet. While traveling the world you will perform our vast repertoire in an outstanding theater for over 1.000 guests. 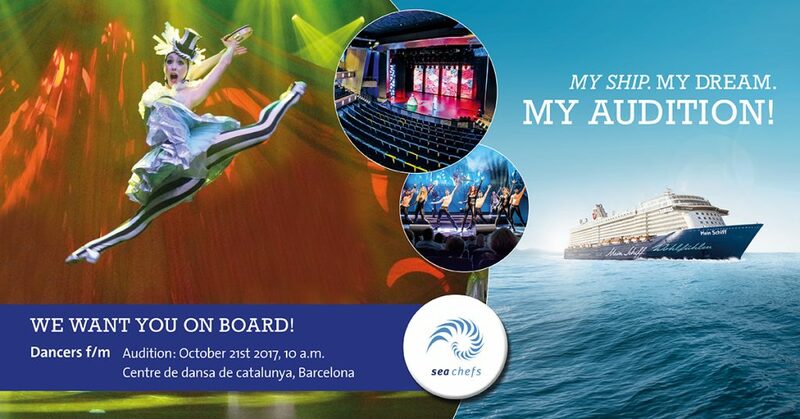 OPEN AUDITION for high quality shows on the TUI Cruises Mein Schiff fleet – October 21st , 2017 at 10am. Professional male and female dancers with excellent skills in ballet, strong background in modern and jazz, experience in musical and /or show and the ability to learn choreography quickly and precisely. Contracts are 6 Months on the vessel, and prior to that a 6 to 8 weeks paid rehearsal period in our studios in Berlin. OPEN CALL, but send CV, and Photos (max. 2MB) to cgi@seachefs.com, Audition will take place in: CDC centre de Dansa Catalunia, Carrer Modern, 28, 08902 L’Hospitalet de Llobregat, Barcelona.